Two Ashton Kutchers enter the ring. Only one will leave, unless Napoleon Dynamite and Billy Bob Thornton have something to say about it. None of the new openers is going to tear the world apart, and the animated Ashton Kutcher film Open Season looks to be tracking very closely in line with the Ashton Kutcher drama The Guardian. 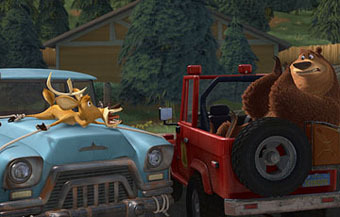 Given that there hasn't been much in the way of decent family entertainment in recent weeks, Open Season, which also features the voices of Martin Lawrence, Gary Sinise, Patrick Warburton and Jon Favreau, appears to have the best shot at breaking out. Sony Pictures Animation is hoping that this buddy story about a bear and a mule deer who rally the forest animals against the hunters who stalk them will attract the attention of youngsters and their families. As we've discussed several times over the past couple of months, the glut of CGI animated films in the marketplace has made the product seem far less special and exciting. This over-saturation has made predicting results a difficult proposition, but we'll still go out on a limb to pick Open Season to fight for top spot of the weekend on the backs of its talking animals. A three-day total of $15 million sounds about right, though that won't make for a particularly impressive per venue average. That leaves The Guardian, the old-guy-mentors-young-guy movie starring Kutcher and Kevin Costner, as our second best opener. Remember when people loved Costner? Those days are long, long past, though he has shown some resilience with a solid performance in last year's The Upside of Anger. No, it's Kutcher who will actually be the draw here, though Buena Vista has assuredly done its best to market the product to both the younger and the older demographic. Sneak previews of the movie were intended to build some goodwill; unfortunately, word-of-mouth looks to be middling at best and the movie sits at around 41% at RottenTomatoes at the moment. The Guardian appears as if it will hold the September line and begin its run with a $13 million weekend.